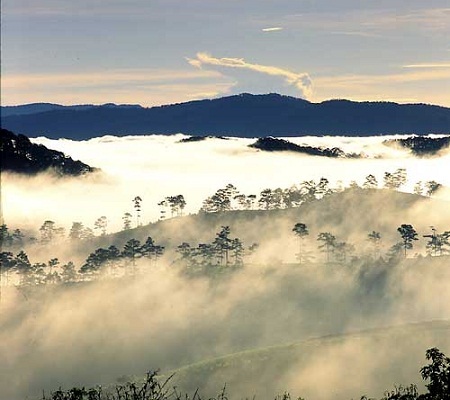 Located in Da Lat (in Lam Dong province) far from the central about 15 kilometers, the Mt Elephant Fairy-stone eco-tourism is a beautiful place. It does not look like any tourist area of ​​this smog city. 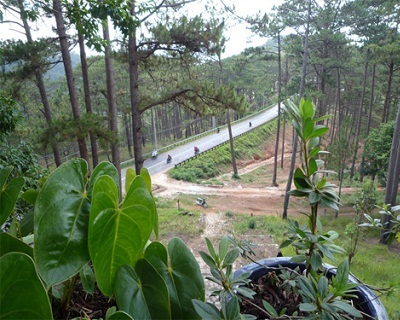 With anyone who applies Vietnam visa for a tour, that person surely should go here to get an experience by a forest living. The path which is from the Prenn pass across Truc Lam, leads in momentum is around Tuyen Lam Lake dreaming. If you go on the road around the mountain, you will quickly enter the momentum dreaming. The name "Fairy stone" is derived from a phenomenon of the two rocks in the mountains; here are shaped like two fairies sit to play the chess. The native forest is high and blue; it covered all of space on the mountainside. At the root of mountains, there is the green grass; they appear the strange flowers and plants with thousands of colors. You can get on a machine or rowing canoe powered by hand to cruise on the surface of the lake with the immense fog in the afternoon. After a process of floating on the water, you go ashore and fishing (with a cheap service for owning the rod and bait); you are able to get a few fishes are foods in the evening-afternoon. If you want to ride the elephant, it will be very interesting. You will sit on the back of an elephant; it will wobble to explore the very large pine trees on the slopes. When you return, you will step on the floor-house of the Ede people. In the inside, and at the long table, there is an arrangement with a variety of cuisines; they are done according to customs of the ethnic minority life; that's the grills. You can also warm your belly with fish soup, which was fished at the previous time. When sitting in a chair, you cannot only enjoy the delicious food, but you also enjoy the traditional dance named "gong" of the Highlands. There are about ten people, including men and women of K'Ho people. They dance and sing according to the "gong ring" around a fire is burning in the red (If in the summer, they will dance on the outside of the pitch). 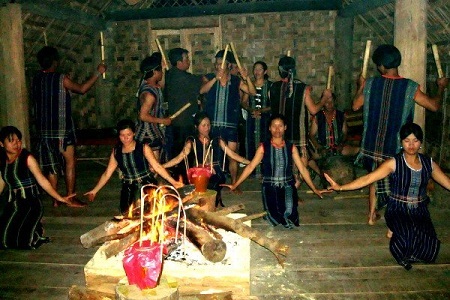 First, this is the Cau Giang dance; followed, those are the items that describe the Spring festival, the Village festival, the buffalo-hit ceremony... They can make a life and a customary practice of Highlands ethnic. Their singing voice lulls people with the fluttered sounds: "Hey ... The star wakes up at the same time the sun is in bed. End of the rainy season is the dry-sunny season. The sun-light is yellow of the corns beard is as Highlands girls... Hey my lover, you do not know the dance, you do not know the song, you just know loving me. Hey... You do not know the dance for my lips blows. You cannot sing for my hands play music"... (Lyrics in the " Kra Yan mi je na" song). And when the night time comes suddenly that no one knew, the fire is nearly stopped. The singing sound is also end, and visitors leave Fairies Stones; the car is driven few kms around Tuyen Lam Lake to the Elephant Mountain. Here, in the middle of the place of forest, the mist covered strong. You will see the beauty of ambiguity as in the poem "Da Lat under dim moons light" of an author names Han Mac Tu. 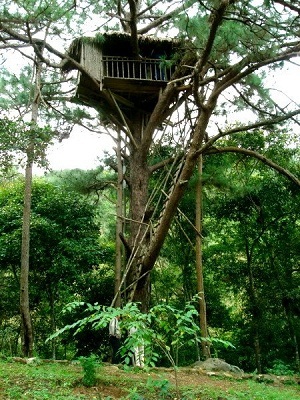 However, the most sudden thing happens that visitors are taken up in the middle of old trees body from 6 to 10 m to spend the night in a leaves hut just is a room which is large enough for two people. This will be an experience for visitors to the wild feeling of a mountain-forest. Here, you will be met with full amenities. It is equivalent to a good hotel room; there is a bathroom and a modern toilet inside. Situated in the room known as the bird cage, you will hear the wind blowing through the canopy pines; it creates a special song of the forest. After you sleep long enough, you'll get up in the morning by the melodious birds singing; it creates a real sense of the euphoria.